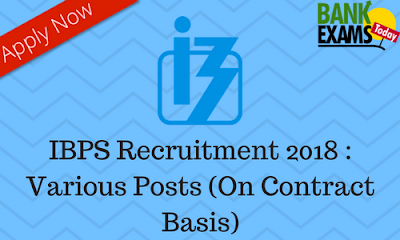 Institute of Banking Personnel Selection(IBPS) has released the notification for the recruitment of Various Posts(On Contract Basis).The interested candidates can apply for the post till 12.03.2018 (before 5.00 pm). Deputy Head-Administration (On Contract): 01. Security Officer in Charge (On Contract): 01. DGM- LEGAL (On Contract): 01. Click Here to Download the Notification & Application Form(Deputy Head-Administration). Click Here to Download the Notification & Application Form(Security Officer in Charge). Click Here to Download the Notification & Application Form(DGM- LEGAL).